Discussion in 'News and Announcements' started by Bob, Jan 16, 2014. 1. If you own a Tundra yourself, sign up on Tundras.com, complete the tasks below to qualify and you can be randomly chosen to win (two winners per day). Posts made before the contest start will still qualify for the contest. 2. If you do or don't own a Tundra, but are a Tacoma World member and your account was created before 1/1/14, refer a friend who has a Tundra to Tundras.com, have them qualify by completing certain tasks (listed below), and if they win a prize, you win a $20 Amazon gift certificate. 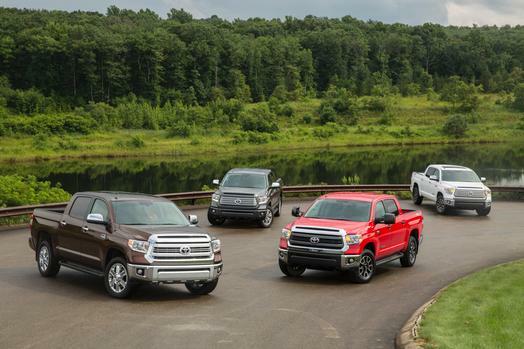 They must enter your Tacoma World username in the referrer box of their Tundras.com account. You may refer multiple Tundra owners to win multiple times, if they win. Multiple Tundras.com accounts by the same person will be disqualified. Spamming other sites or forums will disqualify any winner, but feel free to contact other Tundra owners you know privately. 3. If you don't own a Tundra but have a Tacoma World account created before 1/1/14, you can still register on Tundras.com, participate in the Off-Topic section and/or main technical sections, and you will be qualified to win one of the $50 ToyTec gift certificates being given away at the end of the contest. You must have at least 10 substantive posts by the end of the contest to win. Content which does not belong to you, copied directly from other sites, will be removed. *Only 1 winner per Tundras.com member. Tacoma World referrers may win multiple times. Winners can be disqualified for attempting to cheat (creating multiple Tundras.com accounts from the same person), or going against the spirit of the competition, all at the discretion of the Tundras.com staff. NewRider, excalis, 2qk4u and 3 others like this. I am in! I always end up posting help in the tech forums! Plus, if you know any Tundra owners bring them over here and you can win if they win. I'm down. But does owning a Sequoia count? Can't speak to the second gens, but the first gen tundra and sequoia are so similar from the front seat forward its retarded. Headlights, engine, transmission, transfer case, diffs, cv axles, all the interior (front seat forward), front suspension...all identical. They are basically Tundras. Can't speak to the second gens, but the first gen tundra and sequoia are so similar from the front seat forward its retarded. Headlights, engine, transmission, axle, transfer case, diffs, cv's, all the interior (front seat forward), suspension...all identical. They are basically Tundras. So it's basically a tundra as an SUV? Second gens have a little more differences but like jberry813 said the have a ton of similaritiesbetween body panels and drive train. It's all good. Was more curious than anything. Plan is to keep it mostly stock so a build thread might be a waste of time and sure how useful you guys will find my posts. Cool deal Bob. Awesome idea. Well there is a chance I will fall into the #1 category tomorrow. Bob, does the tundras live picture have to be via cell connection or will wifi work the same way? Asking cause i'm in a country without cell signal atm. jim65wagon and MotoTundra like this. You guys rock! Thank you! It is much appreciated! Congrats to the first two winners! I can now win daily as I am a new owner as of noon today. that is dedication. wanted to win so bad he went and bought a tundra do to so! good luck! @jberry813 and @2qk4u are today's winners! Are you speaking of me On the live post? I thought I posted it on the live post area. It's a pic of my hood being sanded after the paint and scoop was completed. Let me know. And thank you for selecting me.